A collection of my articles, essays, speeches, ramblings, etc. In the spring of 1906 a middle-aged artist sat halfway up Thompson Street with a small board balanced on his knees and a palette of oils at his side. The shades of greens he used for the quiet residential street gave way to the purples and grey of industrial Te Aro, and a skyline dominated by brick chimneys belching black smoke into a clear blue sky. He paused to exchange some words with the driver of a horse and trap slowly clip-clopping up to Brooklyn. Decades of painting landscapes under the unrelenting Southern Hemisphere sun meant Albert Henry Fullwood’s skin was leathery and wrinkled, and thick black hair and beard added a certain wildness to his demeanour. But the speed at which Wellington materialised on the canvas was evidence of a master commercial artist working on a tight schedule to feed the first truly global craze: collecting postcards. The city Fullwood arrived in was the bustling, confident capital of a young country that had rejected joining the Commonwealth of Australia five years earlier – and Lambton Harbour was its focal point. 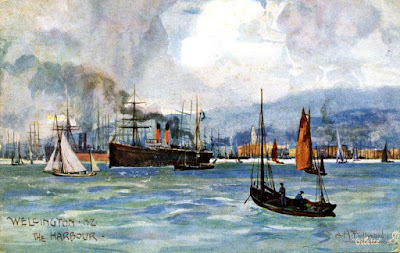 Ocean liners carried passengers to the far reaches of the empire, while tramp steamers and barques worked their way around the coast – the ascendancy of fire over wind not yet complete. The yachts must have caught the publisher’s eye back in London, with an approving caption on the card’s back stating the number of boat clubs meant ‘like true Britons, all the inhabitants love the sport’. And the elegantly dressed women walking their dogs unaccompanied around the Government Buildings and Molesworth Street were good material for postcard sales in Europe, with the small print reminding the world of our universal suffrage: ‘Measures that have only been talked of in other countries have been in existence in New Zealand for years’. 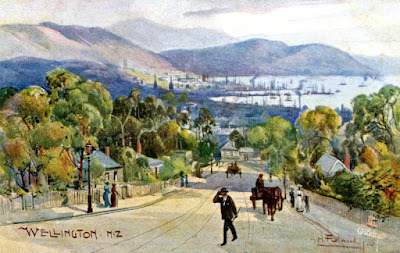 Fullwood’s streetscapes show the city (population 60,000) in the final year or so before the inexorable rise of automobiles – with pedestrians and cyclists mixing with horse-drawn carts. Wellington City Corporation had just taken ownership of the tram network, and the odd choice of Thompson Street for a city panorama was likely because of its proximity to the newly-opened route to Brooklyn. The electric tram would have passed hundreds of workers’ cottages packed into Te Aro Flat’s lanes – the harsh conditions of inner-city living were only a decade after the typhoid epidemics that ravaged Wellington and drove people to the safety of neighbouring boroughs like Karori. 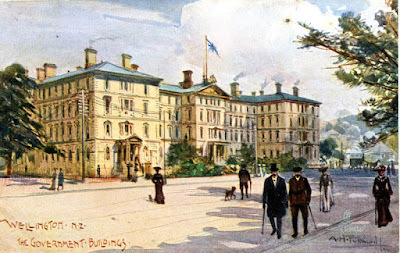 The Kelburn cable car and the Town Hall (opened in 1902 and 1904 respectively) didn’t interest him – a cynic would note the abundance of harbour and waterfront scenes were easier pickings for someone arriving by ship with little time to spare. Fullwood was born in Birmingham in 1863 and emigrated to Australia aged 20. He spent his next three years travelling as a staff artist for the Picturesque Atlas of Australasia, and the range of places he visited during his early career was extraordinary: Thursday Island, Torres Strait, Port Moresby, New Guinea, and later New Zealand. He married Clyda Newman in 1896. By then two of his paintings had been purchased by the Art Gallery of New South Wales. The economic downturn and collapse of the Sydney art market at the end of the 1890s was a catalyst for travels further afield. Fullwood took his wife and their two small boys to New York, Europe and Cape Town in 1900 before setting up home in London (and having another child; a daughter) – just as the world-wide postcard craze was hitting full swing. Collecting cards was a phenomenon in the decade before the First World War, and Raphael Tuck &amp; Sons – a postcard publisher owned by a London-based Prussian Jewish-émigré family – were one of the biggest names in the business. In 1899 the company persuaded the British Postmaster-General that cards should be a standard size with both message and address on one side and the other side free for artwork, creating the postcard we are familiar with today – and the first truly mass media. Tuck’s ‘Wide-Wide-World’ series was launched in 1905, with bright, colourful ‘Oilette’ cards printed in Bavaria (the Tucks didn’t rate British colour printing) and exotic themes like ‘The Arctic Regions’, ‘Pleasure Resorts of Sydney’ and ‘Native Types of India’. The Oilettes were sold in sets of six scenes (half a shilling a pack) and promptly became highly collectable. The extension of ‘Imperial Penny Post’ rates to New Zealand in 1905 helped Wellingtonians swap cards and news with friends and relatives back in the Mother Country for the equivalent of about $2 at today’s rates. Cheaper than telegrams and more widely available than telephones, the volume of mail exploded, with our post service handling 7,500,000 cards in 1909, a figure dwarfed by the estimated 1,000,000,000 cards posted in America at the same time. The General Post Office on Customhouse Quay must have been a hive of activity. Like any rage there were detractors – Punch magazine said letter writing was being killed, mail carriers complained of exhaustion, and religious leaders condemned the ‘plague’ of cards. But it was good business for artists: the interest in collecting cards meant Tuck’s range had extended to a staggering 80,000 different cards by the time Fullwood settled his family in London. 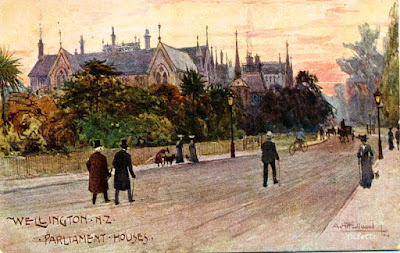 The postcard company promptly sent him back to the Antipodes to capture more scenes for the ravenous trade: the range of Fullwood’s scenes published in the 1907/08 series suggests he worked to a tight schedule in each of the cities he visited across Australasia, possibly staying in each city for two days or less. Ultimately he completed 130 Oilette scenes for Tuck. 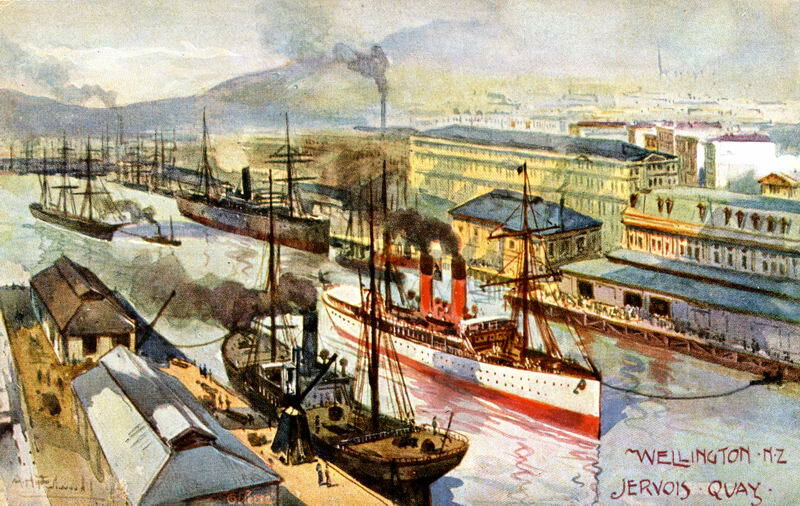 Postcard mania carried on unabated until war broke out with Germany in 1914. Fullwood – by now in his 50s – served in the Royal Army Medical Corps and ended up as Official War Artist to the Australian Imperial Force. His wife Clyda spent time in mental asylums before her death in 1918, and two of their children died at a young age – but Fullwood remained prolific until he succumbed to pneumonia in 1930. While never critically rated, his work was exhibited extensively during his lifetime (with multiple showings at London’s Royal Academy) and numerous paintings are held in Australia’s major state galleries. Raphael Tuck & Sons’ final hurrah was printing cards with secret escape maps for POWs during World War Two, with the destruction of the head office and artwork archive during the Blitz additional motivation for their work. The family sold the business in the late 1950s. Fullwood’s depiction of Wellington didn’t last long. The fire that engulfed much of the Parliament Buildings in December 1907 would have happened months after Tuck published the set of Wellington cards. One card in my collection has the message ‘The houses here shown were burned four weeks ago, at present we have no Parliament House’. The spectacular General Post Office that towered over the adjacent masts and funnels was demolished in the 1970s, with the InterContinental Hotel building taking its place – progress, apparently. The waterfront scenes that caught the artist’s eye are a tantalising glimpse of the commercial bustle on Queens Wharf’s ‘inner T’ (now lost under the TSB Arena) that ebbed away with the rise in air travel and containerisation in the 1960s. But Fullwood’s talent for capturing cityscapes means the Wellington shared by postcard collectors over a century ago is still recognisable today – most of all, we are still a city of walkers. Imagine a Tory Prime Minister chosen to lead his party in 2006, and stepping down in 2016 on his own terms with a long spell of successful leadership in government. The books had been bought back into surplus, troublesome referenda results quickly forgotten, he's still overwhelmingly picked as the 'most popular leader' – and his party is sitting on around 50% in the polls. 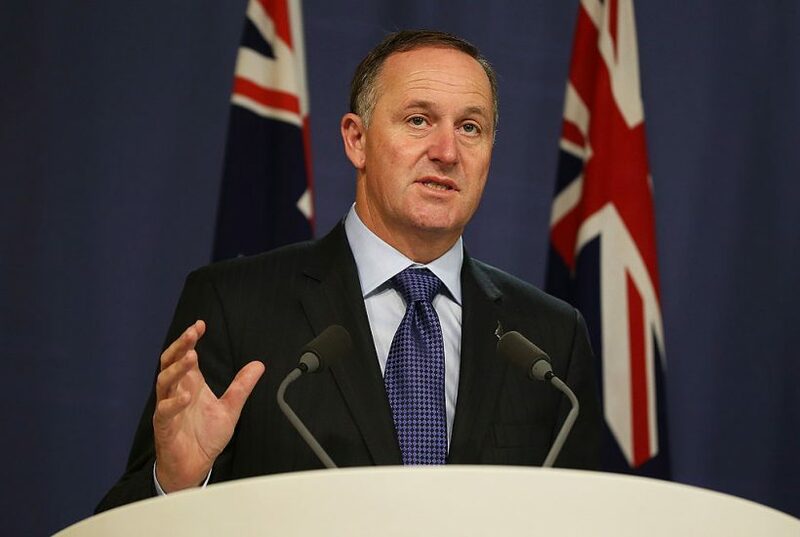 Not, not the restless dreams of David Cameron, but the record of John Key, New Zealand's soon-to-be ex-PM, who unexpectedly announced his resignation earlier today. Arguably one of the world's most successful centre-right leaders since the Thatcher era, Key has dominated New Zealand politics in the past decade. His National party has held near-majority government despite a proportional electoral system that was meant to make such an occurrence impossible, and his departure has given Labour (currently polling worse than its British sister party) a sliver of hope – Andrew Little, the sixth opposition leader to be thrown into the amphitheatre to face Key, looked visibly relieved heaping praise on the man who'd devoured his predecessors. Yet for Key's electoral success there isn't much that screams 'legacy' about his time in office – nothing like Reagan, Thatcher, Kohl, or even Blair. His Labour predecessor Helen Clark created the KiwiSaver compulsory superannuation scheme, and renationalised New Zealand's railways. Key's triumph has been playing the hand fate dealt exceptionally well. He's delivered stable, business-friendly government against a backdrop of the global credit crunch, and ran deficits to shield New Zealand, a country heavily reliant on international trade, from the worst of the economic slowdown. There's been massive investment in transport infrastructure, welfare has been reformed, and the hard work of getting Christchurch back on its feet after the 2011 earthquake is underway – imagine demolishing the bulk of Central London and you get a sense of the task's enormity. Key's goofy moments – memorably pulling a waitress's pony tail – sent the Left into meltdown, but my gut feeling is his 'embarrassing uncle' antics quietly endeared him to the majority of New Zealanders. He's the son of a single mother who grew up in a council flat, married his childhood sweetheart and became a self-made millionaire, yet enjoys popularity comparable to pre-Brexit Boris. So why step down when he's on top, with another term beckoning? Key (who turned 55 in August) said he had 'left nothing in the tank'; he's a workaholic, not a chillaxer, and three decades of punishing work hours as one of Merrill Lynch's top currency traders and at the top of politics are enough. He's served his country, he's estimated to be worth £30 million – and wants to spend time with the family he's clearly devoted to, judging by the social media insights care of his now celebrity children. He says his decision to step down was made in September, and as his helicopter swooped over the shattered roads and railway tracks on his way to visit communities hit by last month's 7.8 earthquake I wouldn't blame him if he quietly felt relieved knowing someone else was going to shoulder responsibility for the rebuild. The big shake almost certainly delayed his resignation announcement until today. New Zealand's three year parliamentary terms means resigning before Christmas gives his successor a clear run into the General Election. Key said he'd 'taken the knife to myself to allow others to come through', but the 19 (out of 60) National MPs elected by the list will need refreshing too – a messy job more easily accomplished by a new leader. There will be some nervous members in the party's caucus, keenly trying to ensure they back the right horse in next week's leadership ballot. And for all the sense that New Zealand is doing well, with the government back to running a surplus, there remain some big challenges that Key has avoided tackling. Auckland's dysfunctional housing market is beginning to make London look like good value. The pension age remains unsustainably low at 65. 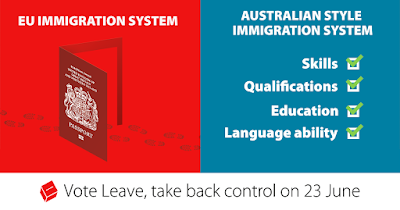 Immigration levels are increasingly worrying some of the National Party's base. And while Key's government signed free-trade deals with Malaysia, Taiwan and Hong Kong, years of work into the Trans-Pacific Partnership went up in flames during the US election campaign – so salvaging something out of the wreckage will be a priority for the next Prime Minister. The collapse of the TPP ranks second to Key's biggest regret – failing to persuade New Zealanders to ditch our Union Jack-based flag in a $22 million, two referenda consultation. But in the scheme of things it's hardly an illegal invasion of Iraq, or making the wrong call in a Brexit referendum. Not a bad disappointment to have after eight years at the top. The EU referendum is the biggest question British voters (myself included) will have to wrestle with in a generation. 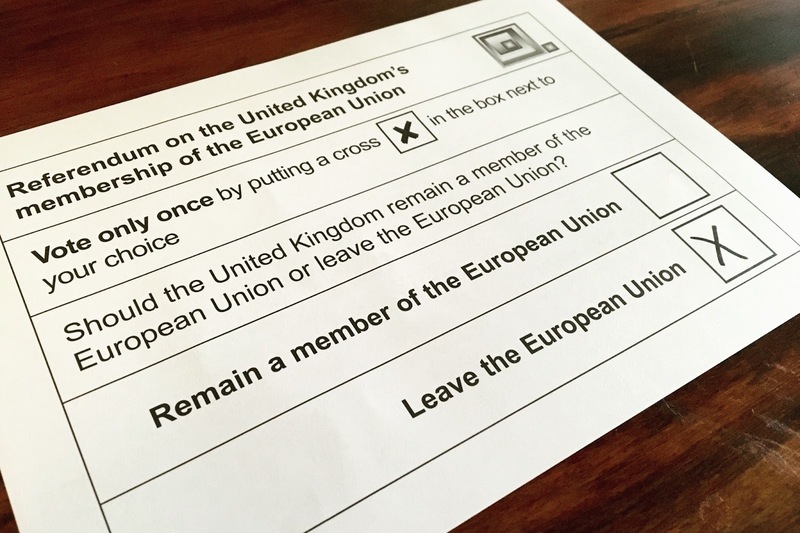 General elections come and go, but deciding on our EU membership transcends the electoral cycle and normal political allegiances. As a postal voter in New Zealand I've already voted 'Leave', so I thought it’d be helpful to explain why I think membership of the European Union is bad for Britain. Both sides have have used 'facts' to underline their positions – but in both instances 'facts' are often tosh. The Treasury's claims that households will be poorer if Britain doesn't vote to remain in the EU are nonsense: back in 2010 the Treasury 'predicted' the Government would be in surplus by now, yet here we are after six year of Conservative government still very much in the red. Likewise, Britain pays £350 million a week to Brussels, but it does get some of that back in return investment – the real figure is more like £180 million a week (still an enormous amount of money). You can use 'facts' to make the case for a vote each way – little wonder people are sick of politicians! 1) Accountability – This is one of #VoteLeave's big arguments: the European Commission is responsible for setting a decent chunk of British law (around 30%, depending on who you listen to) yet of the 28 Commissioners only five have any commercial experience – the rest are career politicians, academics, lawyers, and so on. As someone who enjoys election campaigns the idea of people making the rules without being answerable to the country appals me (and yes, I support reform of the House of Lords). The European Parliament is merely an advisory body, and besides – no-one knows what Members of the European Parliament do. Can you even name your MEPs? Oh – and there’s the small problem of the EU failing to sign off its accounts for almost two decades. It’s estimated that over £5 billion of the annual EU’s budget is lost to fraud. If this was the record of an elected government the politicians would be out of office – but the EU Commissioners are appointed, so they aren’t exactly sweating on this. 2) Eurozone integration – It's clear that the Eurozone will need to consolidate if the Euro is to be viable in the coming decades. Britain – outside the Eurozone – won't be part of this, so regardless of whether we vote 'In' or 'Leave' we'll be on the periphery of the next phase of the EU. Second class European citizens, yet still paying in more than we get out. If the referendum is won by ‘Remain’ then polling suggests it will be by a tiny margin, with debate in the UK and with our European partners dominated in the years ahead by a sense that almost half the population wants out. Let’s pull off the plaster and start building a new relationship with the Eurozone countries, and let them take the necessary steps towards integration that are desperately needed to get their economies back into real growth. 3) Trade – Britain is tied to the EU when negotiating trade agreements. The 'Remain' camp say the EU's size helps during trade negotiations, but this isn't true. As a half-New Zealander I've seen how successive governments in Wellington have been able to secure trade deals with the world's major economies. Smaller is better – which explains why New Zealand has secured trade deals with China, the US, Japan and almost all the major economies in Asia. The larger the block, the more vested interests there are to slow down trade talks – and Europe’s arms are regularly tied by French farmers, Romanian leather manufacturers, and so on. The EU trumpets its deals with Mexico and South Korea (New Zealand has also signed deals with these countries) but on a global level they are small fry. Where is the EU trade deal with China? The US? Brazil? These crucial agreements won’t be signed anytime soon, and that’s a real financial loss for the British economy. Put simply, the EU is millstone for the UK's global trade ambitions – disastrous given that we're in the era of the container ship and digital trade. 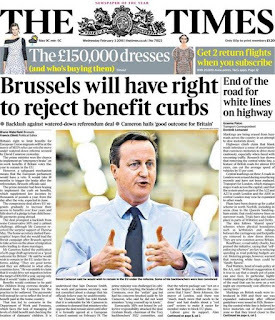 4) Less government – The EU's enormous bureaucratic machine is well known to Britain. 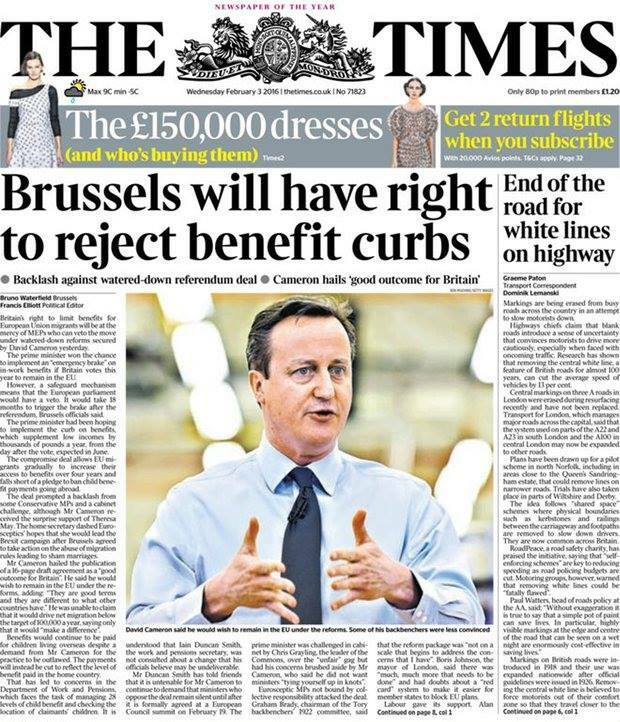 10,000 people working for the EU in Brussels take home more pay than David Cameron. And when all the member states were tightening their belts in recent years it was a major struggle to get the EU to reign in its spending. 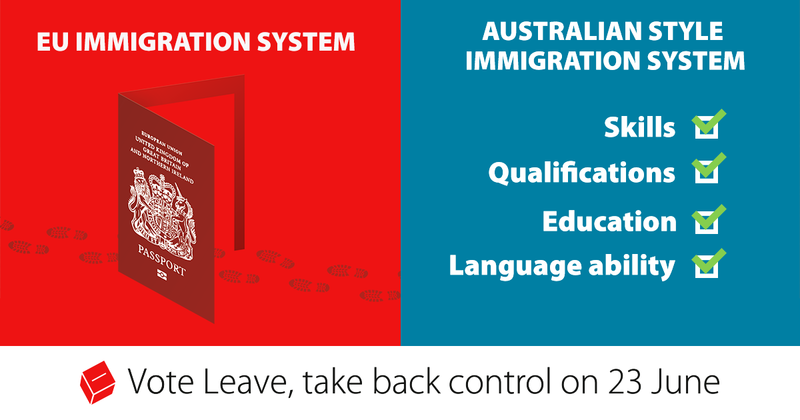 Totally out of touch – so a vote to leave the EU frees Britain from this awful culture of waste. 5) An outward looking Britain – I’d argue that Britain is the most globally engaged European country. I remember organising a fundraiser at one my local curry houses in Tooting – I'd managed to get a junior minister along, and the owner of the restaurant grabbed him by the lapels and told him the government was stopping him from bringing in the talented chefs he wanted to help his business thrive, while the Italian restaurant up the road had no such barriers to contend with. “How is this fair?” the restaurant owner asked. Likewise James Dyson wants to bring the best engineers to help make his amazing vacuum cleaners – but the Government's clampdown on non-EU migrants makes this impossible. Not cool. I want Britain to be open to the brightest and best in the world, and I simply note that New Zealand (where my family is from) has a net immigration level three times higher than the UK, yet people are relatively comfortable with this because they know the government has the ultimate say on the numbers, and can match skills to the needs of the labour force. Blanket freedom of movement has seen wages stagnate, and zero hours contracts are being promoted under EU Flexible Labour Market rules. Millions of Britons are being undercut by workers who are happy to share rooms and send their pay packets home to to their families in countries where the cost of living is substantially lower. High levels of immigration have also pushed up the cost of housing, both in terms of rent, and the overall cost of property – and put enormous pressure to build on yet more of the British countryside. Migrants should be celebrated, but the EU's open-door freedom of movement means this often isn't the case. The perceived lack of control on immigration is utterly toxic for politics in the UK – particularly when politicians shut down anyone who disagrees by calling them ‘bigoted’. But it’s also toxic for anyone coming to the UK and bringing their skills to help make the country a better place to be. As a sovereign nation Britain can adopt an immigration policy in line with the population's wishes. Current polling suggests freedom of movement agreements with countries like New Zealand, Australia and Canada would be popular, but we could extend these to Poland, the Netherlands, and so on – if that was judged to be in Britain's interest. 6) Progressive values – The 'In' camp suggest Brexit will lead to a bonfire of worker's rights, and so on. This simply isn't true – important UK legislation like the Equal Pay Act came into force before Britain joined the (then) EEC, and British values are based on 800 years of common law, Magna Carta, parliamentary democracy, and so on. At the risk of pointing out the obvious, Britain was one of a handful of European countries during the early 1940s that remained open and tolerant, while much of Europe was up in flames. All of which predated the EU. The Labour Leave campaign has a lot to say about how the EU is bad news for the progressive agenda. A Brexit vote won't suddenly turn the country into a Nigel Farage theme park. Blighty will still be home to generous, tolerant people who want a country that's open to the world. New Zealand is a modern, progressive country – and we’ve done this without being EU members. What is so inherently wrong in Britain that you need to be in the EU to remain ‘decent’? It’s a nonsense argument. 7) Security – Supposedly the crowning triumph of the European Union is a lack of war on the Continent since 1945. This is nonsense, of course – it is NATO that has secured peace since 1945, and regardless of next Thursday's vote the UK will still be one of its leading members. Britain will also remain in the ‘Five Eyes’ intelligence network – it’s the most powerful intelligence organisation in the world (with the US, UK, Canada, Australia and New Zealand). Our European partners rely on intelligence we pass onto them, so any suggestion that we may be punished if we leave the EU is utterly ridiculous. The 'EU gives us peace' argument also overlooks the war currently raging between Russia and the Ukraine. The latter would love to join the EU, but this is impossible given its corrupt public sector is wholly incapable of administering government in a manner acceptable to EU members. Ukraine remains outside the EU, and won't be joining for a generation. The EU in its current form is focused on government, rather than trade, and that's deeply destabilising for countries around Europe's periphery that are decades away from having the sort of administration capabilities that would enable them to join the EU. Greece's government is barely able to administer EU law – and look where they are now. 8) EU reform is impossible – Brussels desperately needs to drive a genuine reform agenda, given that the Euro has destroyed the Greek economy (it hasn't been great for Spain or Italy either) and with the far right currently surging upwards in the polls across Germany, Austria, Poland, and so on. These are fully-blown fascist parties, by the way, the likes of which we haven't seen in the UK – yet. But David Cameron's failure to secure meaningful concessions demonstrated just how incapable of reform the EU, and the idea that by staying in Europe we'll bring about change is naive. Besides, what do you think the EU will look like in two decades time? Will it even exist? Will Greece have finally been booted out? Will the 'passport free' Schengen Zone have been wound up? And will the Eurozone have integrated its tax system to try and make the single currency work? A vote to remain in Europe is a huge political gamble, but all the more so when the EU's leadership has demonstrated time after time its unwillingness to cast a critical eye on itself. So that's why I've voted to leave the EU. I'm optimistic about Britain's future – there's not a smidgeon of 'Little Englander' in me – and a vote to leave the EU will mean a Britain that is more progressive, tolerant, and prosperous than at the moment. If the likes of Dyson and JCB want Britain out of the EU, then I’ll listen to them any day over the faceless bankers and career politicians like George Osborne. It won’t be an easy transition, but likewise it won’t be the disaster some on the ‘In’ camp have suggested. Leaving the EU is a decision that will benefit Britain and Europe for decades to come – and will allow us to re-engage with the world. Please Vote Leave on Thursday. Does Wellington need a 12,000 seat indoor arena? It's the start of city council election season in Wellington, and I thought I'd look at the detail behind some of the big campaign ideas doing the rounds. Q: Has Wellington City Council finished paying off debt for building the Westpac Stadium? A: WCC hasn't started paying back the $15 million debt incurred in 1998 – it was added to the City Council’s general debt, which currently sits around the $500 million mark. The interest payments for WCC’s stadium debt are now around $1 million a year. The Regional Council's $25 million stadium loan will be paid off in 2018. Q: What happens to the Westpac Stadium if we move the Wellington Lions and Phoenix to the new 10,000 stadium? A: The Westpac becomes a white elephant, with only half a dozen Super Rugby games and an All Blacks test match if we're lucky. Plus the occasional extravaganza like the Edinburgh Tattoo. Less use doesn't equate to lower maintenance – the grass still has to be mown and the building still has to be looked after. Q: Okay, so let's leave the sports at the Westpac. 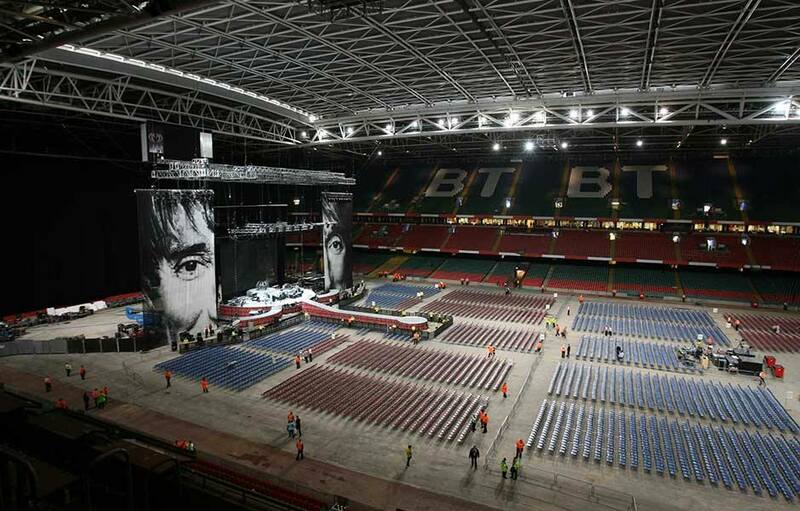 But a covered 10,000-12,000 seat arena would be a great asset for big gigs. Let's build it! A: Not so fast. The TSB Arena (another WCC asset) has a capacity of 5,655. I agree it's not the greatest venue in the world, but how many events is Wellington going to host where the TSB Arena isn't big enough, and that need to be under cover? How many times a year do the likes of Guns’n’Roses come to town – maybe half a dozen? Are we seriously talking about building a venue that will get such limited use? Even band promoters think it's a bad idea. Q: But it'd be cool to have an awesome indoor arena for big music acts, and we'd miss out if we don't build one! A: Yes it would be great, and yes we might miss out. But while there are many advantages with living in a small city, there are also some downsides. This is one of them. Q: Aren't ratepayers already already spending quite a bit to upgrade the Basin Reserve? A: Correct. The City Council has just signed off $21.2 million over the next decade for the Basin's redevelopment. Did I mention we haven't started paying off our late 1990s debt on the stadium? A: Figures haven't been worked up yet, but as a comparison the ASB Centre in Kilbirnie cost $47.5 million back in 2007, and the Westpac Stadium cost $130 million in the mid-1990s. A rough ball park figure would put the cost of a new 10,000-12,000 arena at around $60-85 million - around half the cost of the $134.4 million for the new convention centre and film museum. Q: Could we have a monorail running between the railway station and the new mini-stadium? A: That's an excellent idea – already covered in The Simpsons. Because there are definitely no similarities between Wellington and Springfield when it comes to wasteful spending. The City Council's overriding objective for sports venues should be to work with our regional partners across government, sport and the to ensure we have a stadium with the capacity to host the major events we're likely to get in Wellington. 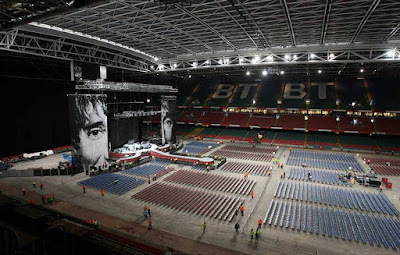 Yes it'd be lovely to have a dedicated mini-stadium for the Phoenix and Lions, with the ability to host large events for artists like Madonna, but as a city of 200,000 (and a region of 500,000) the reality is it'd be a financial millstone round every Wellingtonian's neck. We need to develop other tourist infrastructure first: major Wellington events see our existing accommodation stretched to the limits, and friends working in Wellington's tourism sector say the city needs two more large hotels if we're serious about economic growth from tourism. Besides, shouldn't we make some progress on getting our outstanding Town Hall back into operation before we chase after the next hare-brained idea? So I think we're better to start thinking long term about what the eventual replacement for the Westpac Stadium will look like. That might seem like a long way off, but in the competitive world of hosting major sporting events a lack of roof and inflexible capacity will make the Westpac less attractive as other stadia across Australasia are upgraded: the New South Wales Government has just signed off a major refurbishment of Sydney’s Olympic stadium (with demolition of the 17 year old building seriously considered). Athletic Park hosted our major sporting events for a century – no-one seriously believes the same will be true for the Westpac. So the eventual replacement will probably be built for a rectangular pitch. Everyone prefers watching cricket at the Basin, and there have only been barely a dozen games where attendance has been higher than the Basin’s 13,000 capacity. Building a multipurpose stadium round an oval pitch is a huge design compromise – so we’re much better to cement the Basin’s reputation as one of the world’s great cricket venues with an extra 5,000 seats. And a new stadium in Wellington will have a roof. The total capacity will be a little higher than Athletic Park's 39,000 (and definitely more than the Westpac's 35,000 seats), with a layout that avoids the notorious 'sea of yellow' evident for less attended events – perhaps with tiers that can be blocked off for smaller fixtures, or by using drapes. The Welsh have done this successfully with Cardiff's Millennium Stadium – and scaled down version of this would work well in Wellington. But this is a conversation to be had in the 2020s. We get one chance every generation to build a major sports facility that adds to the city. Until then we need to make the most of what we've got – and avoid pouring money into 'great Wellington assets' that'll be operational and financial disasters from the outset. In the meantime, here's the NBR's Tim Hunter discussing the latest outbreak of the 'stadium virus' in New Zealand. 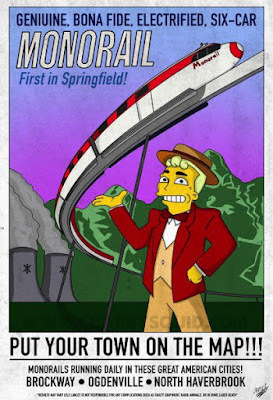 And do try and track down the Monorail episode of the Simpsons, as it didn’t end happily for Springfield. You’ve been warned, Wellington. Wellington has a rich history of maps for a young city, although our location – tucked away at the back of the harbour – meant early explorers left the bottom of the North Island as a blank. The oldest Maori geographical record on paper, a 1769 map by Tuki Te Terenui Whare Pirau’s had little detail south of Taranaki; James Cook’s famous chart of New Zealand (drafted just months later) showed Wellington’s south coast but nothing beyond the harbour entrance. Maps are first and foremost tools; so logically enough the first paper representations of Wellington were nautical charts. Captain Thomas Barnett’s 1826 marine survey of Port Nicholson showed invaluable details for early settlers: not just latitude and longitude, suitable anchorages and water depth, but also information like the pa sites (at what’s now called Palmer Head), the Maori village (Worser Bay), and locations of fresh water (Miramar, Evan’s Bay, Petone and Ngauranga) – crucial information for survival after months at sea. New Zealand’s hinterland was uncharted until the late 1830s, when the arrival of Wellington’s first European settlers resulted in an explosion of mapping, driven by the pressing need to divvy up the land. The weather was challenging, with the New Zealand Company’s Surveyor-General William Mein Smith complaining “I have not the means of protecting either my instruments or plans from the wet”. It was tough work, with Māori employed as survey hands to help determine the size of the parcels of land being sold. An alternative approach was to draw up plans for the settlement in the comfort of distant London, away from Wellington’s testing climate. Which explains why Samuel Cobham’s beautiful 1839 plan for ‘Britannia’ (now Petone) straddling the Hutt River looks so ludicrous: the carefully drawn locations of government offices, public baths, museum, barracks and a college of surgeons had missed one important detail: the extent of the river’s flooding. So in 1840 the settlers decamped to Te Aro, keeping the grid layout of streets, although plans to use familiar London names like Covent Garden and Billingsgate Fish Market didn’t survive the move. Surveyor-general Mein Smith drafted the settlement’s first maps, which the New Zealand Company quickly turned into advertising tools for driving interest in colonial life back in the ‘Mother Country’. Its ‘Plan of the Town of Wellington’ – printed in London in 1840 – was deceptively elaborate: most streets were still covered in bush, and the legal title of the land hadn’t been secured from the locals – when surveyors marked out the new town at Te Aro the local Māori pulled up survey pegs, protesting they hadn’t actually sold the land. 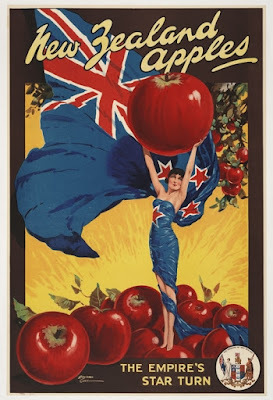 Prospective settlers were led to believe otherwise, bewitched by the combination of bold colours, clear street layout and the company’s crest – along with the assurance settlers would be moving to the “first and principal settlement of the New Zealand Company”. It was a moderately successful tactic, but sowed the seeds of the company’s downfall: London speculators bought parcels of Wellington land, without any intention of migrating. Fortunately 15,000 (mainly labourers) did make the voyage from London, before the company went bust in 1858. Wellington’s maps are easy to date because of the slow creep of land reclamation into Port Nicholson harbour. The city’s growth soon demanded larger wharves, and land reclamation became a priority, made all the more pressing by the 1855 earthquake that left the jetties unusable. Queen’s Wharf was the first to be built (1864), and it was long; around three times today’s length, stretching over to Customhouse Quay. The incorporation of Wellington City Council in 1870 heralded a huge increase in land reclamations, but the most dramatic planned alteration never materialised. In 1877 Danish architect Conrad Seidelin – working under the pseudonym of ‘Mr Darnoc’ – drew up plans to transform the waterfront. Seidelin’s credentials had been established in the redesign of Copenhagen, where his proposal to demolish the city’s walls won Denmark’s Medal of Merit two decades earlier. 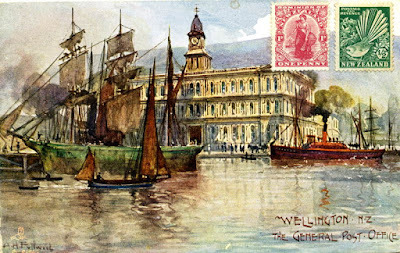 Alas Wellington’s city councillors considered Seidelin’s suggestions impractical and expensive: curved docks and enormous land reclamation were luxuries the capital could ill-afford. Seidelin died in Dunedin a year later; long forgotten in New Zealand, although his impact on Copenhagen’s design can still be seen today. When I was little my godmother gave me a book about flags. The cool kids were into Dungeons and Dragons (look who's laughing now!) but I loved reading about how Old Glory got its 50 stars, and how the Soviets and Left had adopted blood red as their colour. Some of the best flags were the simplest, especially France’s Tricolour, but I felt sorry for kids in Brazil trying to draw their flag’s complicated depiction of the stars, which also includes the Southern Cross. Nepal’s double triangle-shaped pennant just seemed weird – and definitely not a proper flag, to my eight year old eyes. 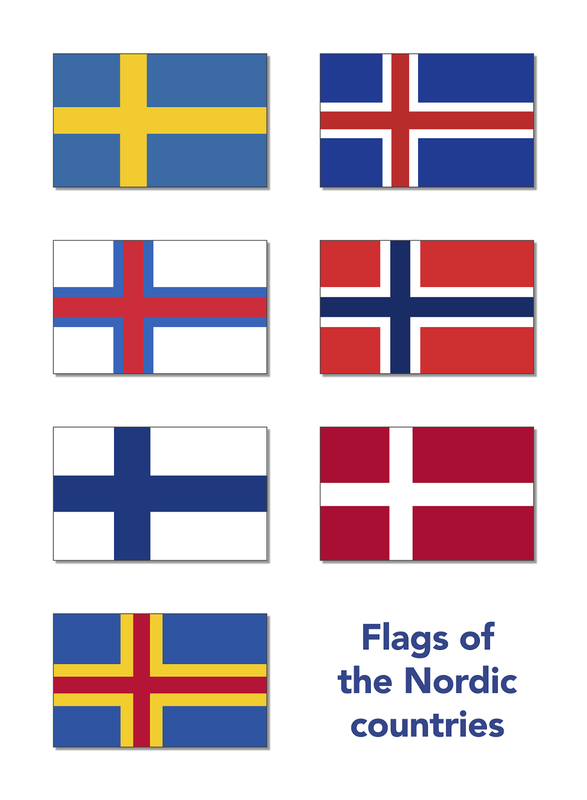 The shared history of nations also means many countries have similar designs: Norway, Sweden, Denmark and the other Nordic countries all seem to have conquered each other at various times, but today are happy with flags that many foreigners struggle to tell apart – a similarity that also reflects their common values of progressive democratic society, and strong relationships between their people and governments. The flags of the six nations and one autonomous region are on the right – can you identify them all? I’ve really enjoyed the debate about changing New Zealand’s flag. I think the government got the process terribly wrong – a committee stacked with Olympic medal winners and rugby players manifestly didn’t understand the complexities of visual communication, and it was little surprise that the shortlisted designs looked very similar to some of the kit they’d worn when representing the country on the sports pitch. My favourite moment was when an academic from Massey University explained that the population ‘struggled with abstract designs’ and reassured us that ‘the best national flags featured two colours and one symbol’. Try telling that to an American, Frenchman or Brit. There were some good flag designs in the long list, and I’d have been torn had Red Peak made the final referendum, but Aaron Dustin's design came a distant third in the shortlist ballot. New Zealanders wanted 'familiar' and voted for designs that incorporated the silver fern, which is a pity because Red Peak’s success was built on the idea that a flag design had to have a story, rather than just replicating a symbol and running it up a pole. So one of the worthwhile parts of the debate has been coming to understand what I like about New Zealand’s flag – I suspect most of us haven’t really thought about out national flag in any great detail until the referenda kicked off. New Zealand’s current flag is based on a 19th Century British colonial template, but looking at it with fresh eyes I see a powerful symbol of the relationship between the Crown and Maori, with the Union flag in the top left, and the stars on the right representing taonga guaranteed under the Treaty of Waitangi many generations ago. The colour range is also pleasing – again, something Red Peak got right, yet a real weakness of the proposed Kyle Lockwood alternative with its lurid blue set against black. But it’s the message of our existing flag that makes me passionate about keeping it as our national emblem. Partnership is an inherent component of modern New Zealand – the era of grievance settlement is drawing to a close, and Maori and Pakeha are building a country where we recognise our rights and responsibilities because we have come to terms with our history. None of the finalists came close to New Zealand’s current flag in communicating that to me, and while my interpretation of the flag is very different to that which my grandfather would have had, it remains a symbol that has bound our nation together for generations. So I’ll be voting to keep the current flag. It is a pity the referendum has been portrayed as a $26 million pet project of the Prime Minister, and even more so that people might choose to vote along party lines. But that is their decision – it’ll be a generation before they have the same chance again. I agree ours is similar to the Australian flag, but as a country we’re pretty similar too. Same head of state, same legal system, same frigates, and so on. We’re just better at rugby than them. 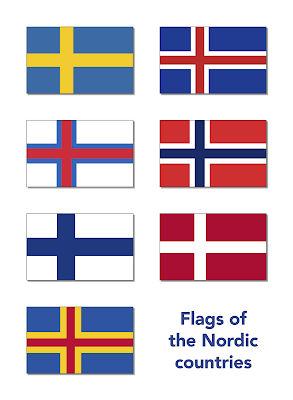 Besides, count your lucky stars you’re not Norwegian, or Icelandic, or whichever one it is that has the yellow cross on the blue background! Boundary reforms don’t normally make for gripping political news: they’re the stuff of the Conservative Association stalwart or eagle-eyed agent, and definitely not for people with healthy social lives. But whether we like it or not, the Boundary Commission’s regular redrawing of the electoral landscape from 2018 onwards will revolutionise the culture of our local associations. 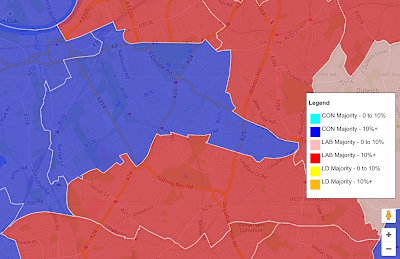 Many constituencies have retained the same basic shape for decades. 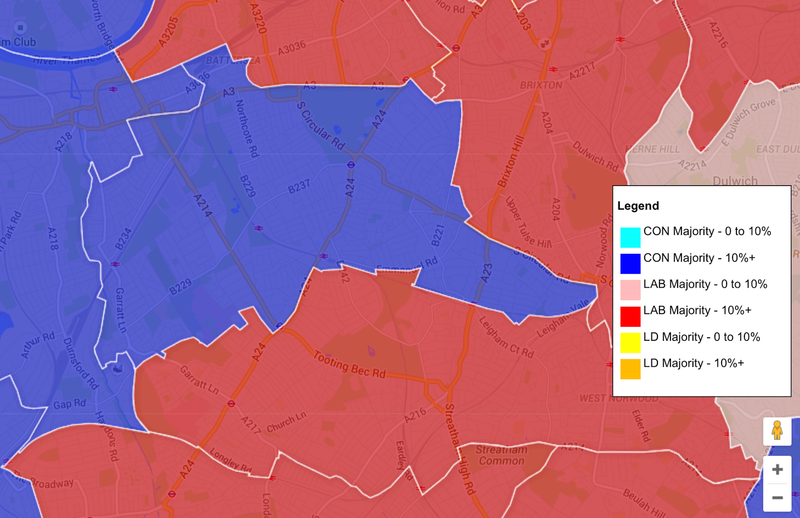 Tooting – my patch – has been essentially been the same since it replaced Wandsworth Central in 1974. Yet the reforms likely to be in place for 2020 will require the number of electors in constituencies to adhere to a much tighter variation from the national average, and for this to be reviewed every five years. 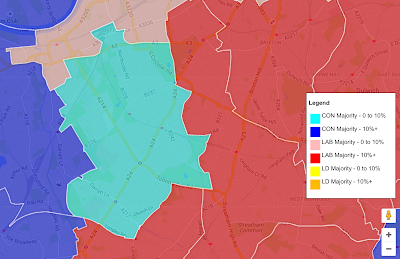 The difference in the two proposals for Tooting during the 2013 Sixth Periodic Review shows the level of change that is likely to be in store for constituencies across the country under the new rules. Throw in the renaissance of our cities, and you can see how the electoral map will need to be drawn from scratch with each review. London’s expected growth of 100,000 people a year up to 2030 is the equivalent of seven new constituencies between each general election. Manchester will expand by an extra 100,000 people by 2025 – considerably faster than projections for the surrounding urban area, which are also expected to grow. On the other hand, Birmingham’s forecast growth of 12.2 per cent by 2032 is forecast to be below the national average of 13.5 per cent. Our electoral boundaries will behave like an electoral isobar map, with areas of high population growth seeing constituencies created at the expense of places where the population increase is slower, or in decline – and Individual Electoral Registration will finally give the Boundary Commissions accurate data, cleansed of ghost voters who have moved elsewhere years previously. The post-2018 landscape will see constituency associations with five year lifespans, thrown together across municipal boundaries, with the aim of winning the next general election. And after the returning officer’s declaration the focus will be on preparing the ground for the following election – although no-one will have any idea what cards the Boundary Commission for England will deal! As a result, our traditional constituency identities will be much more fluid. Indeed, referring to constituency associations as ‘Tooting’ and so on will soon be archaic. Geographic identities are less easily accommodated by the new reforms (remember the outcry over the proposed Devonwall constituency when the Prime Minister pointed out that “It’s the Tamar, not the Amazon, for Heaven’s sake,”? ), and our local leadership will be shaken up between every election, with association officers, star volunteers and local party bores suddenly finding themselves in different patches, with new relationships to forge. Stable geographic identities are important for building teams of activists. The need to organise campaigns for county, borough and PCC elections on well-established boundaries will remain, and bringing associations together is sensible, since constituencies will change radically with every boundary review. Andrew Kennedy is a tireless advocate for groupings such as West Kent, which has demonstrated many of the benefits of campaigning as a larger unit. We in Wandsworth have operated as a group for many years, and consequently the Wandsworth Conservatives brand is very strong in our community. Our office supports local associations in five constituencies across Wandsworth and Merton, and it is perhaps time for us to bring neighbouring Lambeth into the fold, since ‘Tooting’ is highly likely to include parts of Lambeth in the coming years. Some association officers will take the view that forming groupings is a long term objective. I believe that this is misguided. The Boundary Commission’s consultation timelines will see the 2020 electoral map finalised in late 2018, leaving a year and a half to select candidates for all 600 seats and build campaign momentum – a sprint compared to the two-and-a-half years that many of our 40/40 candidates enjoyed (or suffered). This shorter campaign period will also help reduce the costs of standing for parliament – an unintentional positive – but the creation of new boundaries from scratch will make reselection of sitting MPs more competitive, as many of Labour’s Blairite wing are all too aware. The combination of major changes to a constituency and relatively little time to execute a campaign will put a huge emphasis on best practice in both modern campaign techniques and old-fashioned organisation. Working together as a larger group of Conservatives means having the resources to deploy up-to-date campaign tools: professionally designed literature for council campaigns, digital campaigning (such as the Crossrail 2 campaign we’ve run in Tooting this autumn) and modern membership engagement. And active ward teams will be even more important, as a safe ward in a safe seat might become a safe ward in a battleground seat within the space of five years. We are about to enter a dynamic electoral landscape where incumbency counts for less, and finally rid of the bias towards Labour and the Liberal Democrats that made majority government seem impossible before May 7th. Our party has pushed for these reforms – now we need to make sure we’re ready for the challenge in 2020, and beyond. I'm a business strategy consultant with Beca. In my spare time I work my way through the mountain of books at my house, and head into the bush. After six decades of the British Bomb, are nuclear weapons still a game changer for the UK?